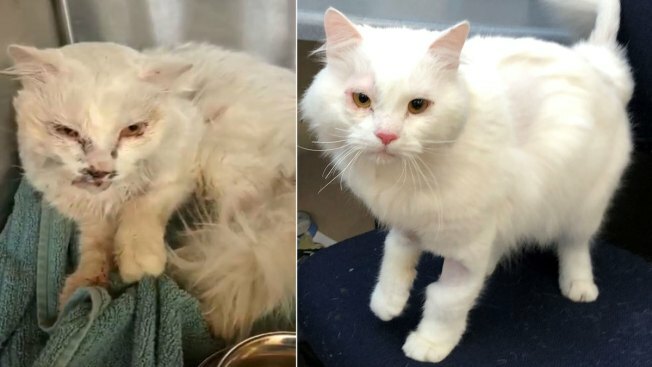 A cat that was struck by a car and seriously injured in Daly City in February is now up for adoption after making an unexpected recovery, according to the Peninsula Humane Society & SPCA. The cat, named Toa by PHS/SPCA staff for its meaning of "warrior" in Maori, was found on the side of a road on Feb. 26 by a good Samaritan walking his dog. The cat had a broken jaw and injured eye, was in shock, and "was in such bad shape, we didn't expect him to survive," PHS/SPCA spokeswoman Buffy Martin Tarbox said in a news release. However, surgery to wire the cat's jaw shut and the insertion of a feeding tube helped Toa to recover over the following few weeks and he was eventually able to eat on his own and had treatment on his injured eye, according to the humane society. No one came forward to claim the cat, which was placed in foster care and has now been brought to the PHS/SPCA adoption center at 1450 Rollins Road in Burlingame to be made available for adoption. "Although Toa looks like a battle scarred cat, he is very sweet and friendly, " Tarbox said. "He's been through a lot and we want to find him a new home where he will be safe and loved." Toa is estimated to be about two years old and has a long-haired white coat. He is neutered, microchipped and vaccinated, and his adoption fee is $80, according to the PHS/SPCA.